Jaypro's new Round Club Goals have a patented built-in counterweight for additional safety and stability. Solid steel bars are hidden inside the backstays to help prevent accidental tip-over. The goals are all aluminum and have steel-reinforced corners for exceptional durability. The goals are available in the following sizes: 8 feet high by 24 feet wide, 7 feet high by 21 feet wide, 6-feet-6-inches high by 18-feet-6-inches wide, 6-feet-6-inches high by 12 feet wide and 4-feet-6-inches high by 9 feet. The Park-Pro by Pro-Bound Sports is one of the best 6-inch square post styled outdoor basketball supports and more appealing than other comparable systems. Painted with white hardened acrylic enamel, it ensures years of maintenance-free use. The 4-inch-by-6-inch extension boom carries either the 42-inch-by-72-inch conversion tempered glass backboard or Pro-Bound Sports' deluxe Iron Clad reinforced steel backboard. The five-foot extension allows for rugged play, and the pole is permanent or removable. The extension boom attaches to the post with clamps, offering infinite elevation heights up to 10 feet. The post, extension boom and backboard braces carry a lifetime warranty. Vantage Products International now offers the Big Bubba Professional Portable Batting Cage. The Big Bubba is a superior choice for high school, collegiate and professional baseball programs at a considerable cost savings. The heavy-duty aluminum construction, easy portability and collapsible design make it an ideal backstop for any level. Its unique dolly assembly at the rear makes one-person maneuvering easy. It measures 18 feet wide by 12 feet high and collapses to only 5 feet high to limit storage space requirements. The 16-inch pneumatic wheels make relocation simple, and 42 feet of ricochet cushion minimizes ball rebound. 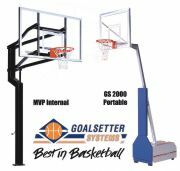 Goalsetter Systems, Inc., produces some of the best basketball products in the world. The company offers a complete line of outdoor height-adjustable goals, indoor wall-mount systems, portable units, competition glass backboards and rims. Goalsetter basketball products are engineered to combine unmatched durability and aesthetic value to meet the needs of today's toughest playing environments. Douglas Industries is a manufacturer of sport nets and equipment for a variety of sports including tennis, baseball, basketball, soccer, volleyball, hockey, golf and custom products. With more than 30 years of experience, Douglas is dedicated to fulfilling your sports equipment needs with complete satisfaction. Bison, Inc. has extended its line of aluminum portable ShootOut soccer goals. There are now five sizes of 2-inch-by-4-inch goals for all ages and levels of competition and three popular sizes of 4-inch-by-4-inch portables. Both styles have a new torque-tested backstay attachment that eliminates corner weld failure, common on portables. All units feature QwikTrack net attachment tracks, rear stabilizer bars and auger-style safety hold downs. Tubing has a 3/4-inch soft edge radius for player safety. Wheel kits come standard on 4-inch-by-4-inch goals. Free HTTP braided nets are included with goal sets ordered from Bison dealers through June 30, 2004. Switch from adult to youth league basketball in minutes with the Easy-Up Youth Mini Goal, used at more than 20,000 camps, schools and recreation facilities. One person can install the goals from a step stool on any style or make of goal or backboard. No tools are required, and it will not damage the existing goal. Three fixed-height Easy Up goals mount rims at 8 feet, 8-1/2 feet or 9 feet and the new 5-In-1 Adjustable Easy-Up at rim heights between 6-1/2 feet and 8-1/2 feet. All have a 48-inch-by-32-inch backboard of high-impact ABS plastic with a lifetime limited warranty. Aim for exciting new heights of indoor or outdoor play with the colossal Jumbo Jam. This inflatable, heavy-duty vinyl basketball goal measures an amazing 8 feet high with a 4-foot diameter hoop and 10-foot diameter base. Use it as a lead-up to basketball or create original new games just for fun. It inflates easily with any standard pump.